The 1.91-hectare build will be sandwiched in between the B6241 Eastway and the M55, to the west of the A6. A new retail park has got the green light to start development work in Preston. It will see a small supermarket, six shops, a pub and a drive-thru café built in an area previously only used for agriculture and pasture. At least 12 housing sites are under construction in the wider area which will ultimately bring 2,426 homes. A petition with 224 signatures was handed into Preston City Council (PCC) highlighting traffic woes and arguing the area is already gridlocked in an attempt to block the plans. It is an area which was earmarked in the Local Plan for housing and 140 homes are being built in a scheme to the West of the vicinity. Addressing councillors at the development meeting, applicant Matthew Symons of Hollins Eastway said: “Our original scheme was much bigger than what we are now proposing. He also told members that the build would create 132 jobs. A similar outline planning application from the firm had been sent to the council in 2014 which featured plans for a bigger supermarket and included a petrol station. It was refused by members and although the builders appealed the decision it was dismissed by an inspector. Representing residents, Coun Rowena Edmondson appealed to members of the development committee to reject the revised application. She added: “The roads are smaller and not coping with the current amount of traffic and this development will only make it worse. “We currently already have Sainsbury’s Express and Aldi under construction. Before voting nine to four in favour of the scheme city councillors raised their concerns about the increase in traffic during a debate. Coun Sue Whitham said: “I have some concerns about this option. It was originally marked as residential. “We don’t have a five year supply at the moment and we are not building enough houses. In order to mitigate against the increase in traffic developers have outlined the number of properties within walking and cycling distance. Hollins Eastway planning papers state: “The site [is] within easy walking and cycling distance of a significant number of existing and proposed dwellings. “At present, there are approximately 1,826 dwellings within 1,200m walking distance of the site. “When the proposed and approved development within the North West Strategic Location (NWPSL) is taken into account, this figure increases to approximately 2,251 dwellings within easy walking distance of the site. However, Coun Robert Jolliffe also expressing his concern about traffic congestion said that residents were very unlikely to walk to and from the shops carrying their groceries. He also agreed with coun Whitham that the land should be dedicated to a residential development. But coun Peter Moss said: “The application is before us now for the third time. I think we can gauge the enthusiasm for retail as opposed to residential. Planning documents from Hollins Eastway say the firm anticipates that the development could be built in two years. 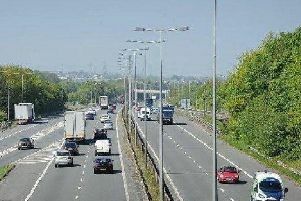 * Highways authority Lancashire County Council is bringing a major new road to link up Preston to the M55 motorway to ease congestion in the area. Part of the Preston Western Distributor project will see a new roundabout come to nearby Lightfoot Lane, where it is meets Tabley Lane. Because housing pays for infrastructure there is a time lag before facilities such as roads can be put in place.